The fall 2012 semester has begun and the organizational systems and human science students are well into their journey exploring ethical issues that arise in organizations and society. The open and honest conversations have been very engaging and challenging causing all to stop and ponder the thoughtful insights developed, their practical applications to the business sector and the world-at-large, and their ramifications for today’s professionals and leaders during these turbulent times. What follows are some musings from this journey as I grapple with writing a conference paper on “fostering moral courage” in business professionals that is to be delivered next week. Musing #1: Much in life relies upon the particular choices we each make. Choices are creative and hold power to shape the world and future. The type of life we want to live, the creation of a sustainable future, and the organizations conducting businesses in an ethical manner all depend on choices—our choices. Acknowledging that we are not solely responsible, each of these do depend upon our choices and willing active engagement. Hold businesses to being responsible citizens. We do not have to be subject to or trapped by our past or destructive social or business practices. It is our choice. Choices involve decisions that result in actions. So if we want less stress in our daily lives, to slow global warming and to turn the economic down turn around, we must personally choose to act. Musing #2: Fundamentally, being ethical is about making choices—choices that enable us to live in relationship with both other people (as well as ourselves) and the natural world around us in a way that is respectful and not harmful. Ethics is about creating systems that aid us to structure making choices, establishing relationships, and discerning actions that treat others with dignity and do not harm. If one chooses, respect can be elevated to care and even compassion and justice, and relationships can become meaningful, life-enhancing partnerships rooted in interdependence and solidarity. Again, a choice. Take responsibility for one’s actions whatever the consequences. Musing #4: Moral courage, though, is not about being a hero, saint or martyr. It is not about bold, audacious actions in the name of being ethical or pursuing truth and justice. Seeking well being, justice and prosperity for the good of all. When acting in a morally courageous manner, it is important that it is done in the context of ongoing self-examination and critical reflection, including one’s owns viewpoints, assumptions, conclusions, and practices. Musing #5: A creative tension needs to be maintained between being realistic and idealistic; between being too pragmatic and overly altruistic. They both have their pitfalls. Pragmatism, being realistic and practical, can create obstacles to being ethical or introducing ethical changes. At times it can foster rationalization that maintains current unethical practices and can lead to a sense of complacency that results in non-action. In the current highly-competitive, profit-driven business climate, it can cause professionals to rationalize away the challenge to make tough or risky decisions, or address harmful organizational conduct, business philosophies, or economic policies and global practices. The “dirty hands” perspective (or “the ends justifies the means”): One must perform or collaborate in unethical practices to aid the organization and the common good because that is the only way one can act and remain a viable business. To not act, even if it is unethical, would lose the business opportunity. Conventionalism (or compliance with the status quo): One cannot act differently or make changes because this is how business operates. Scale (or powerlessness and hopelessness): The issue is too large and complex, and it is therefore too difficult to make changes. A single person with only one voice is too small and ineffective to make a difference. Self interest: If one acts differently or is confrontative, one could be ostracized, which would negatively affect one’s job, career advancement, financial security, and social or professional status. The personal and professional cost is too great. Concluding Musing: Considering the significant economic, political, environmental and social issues we face today, one could say that we stand on a precipice. Many experience this position as a mountain top that enables vision and clarity because of the vistas it provides. While some settle in at the top and proclaim what they see, others travel back down to enhance the well being of the valley inhabitants, though, the route may be long and journey treacherous at times. Many experience the precipice as an edge—the rim of a canyon that is dangerously deep, filled with the unknown, and risky to navigate. Some pitch camp at the edge and continue to live as securely as they can, while others step into the dark vastness in the spirit of discovery, justice, and adventure willing to engage whatever they encounter for the common good. How do you experience the turbulent times in which we live? 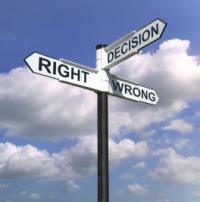 What ethical choices do you face? What actions are you willing to courageously make?